We’re cyclists, and therefore it’s very easy to manufacture an excuse to buy another bike to add to the collection, but is a dedicated winter bike a luxury you could really do without? Or is it a necessity? What is a winter bike? Put simply, a winter bike is a ‘second’ (or third or fourth…), relatively inexpensive bike that you literally ride in the winter (you didn’t see that coming, did you). Normally, though, it’s a bit more than that as it should be equipped for winter riding: disc brakes are becoming an almost must, and mudguards, cheap/old wheels and wider tyres are all things that are regularly fitted by the winter bike user. You may also wish to include a frame-mounted pump to deal with the inevitable punctures, saddle pack for spare tubes/clothing and, of course, a decent set of lights. All common sense stuff. You could, of course, only have one bike and put all these items on it for winter, but constantly swapping parts on and off dependent on the weather can be painful when you just want to get out and ride. Your bike will undergo far more wear and tear in the rougher weather, too, so it pays to keep your best bike out of the worst of it. Why have a winter bike? A winter bike: Alloy frame. Check. Mudguards. Check. Lights. Check. Dirt. Check. The winter brings with it bad weather, and in Britain that also means mud, salt and potholes. A bike can very quickly get covered in a black film of corrosive crap that can have an adverse effect on gears, braking surfaces and the frame itself, let alone you getting splashed with grime too. 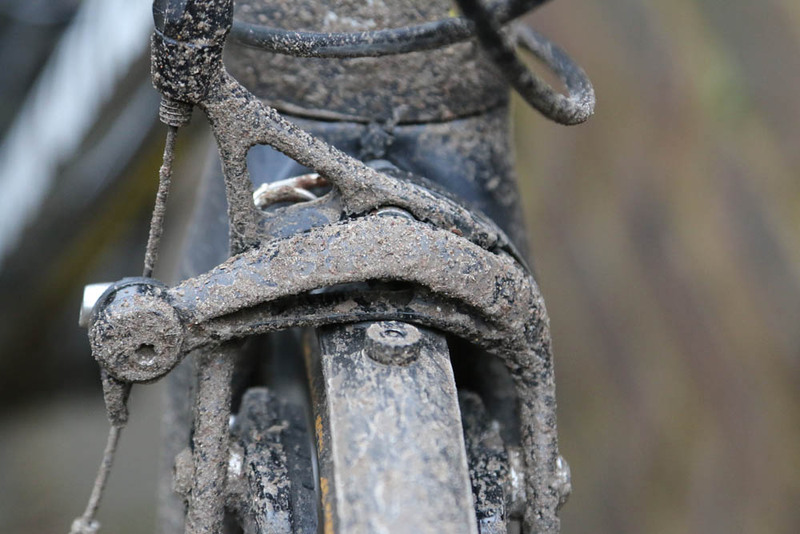 A soggy bottom is not a great companion on long, winter rides. 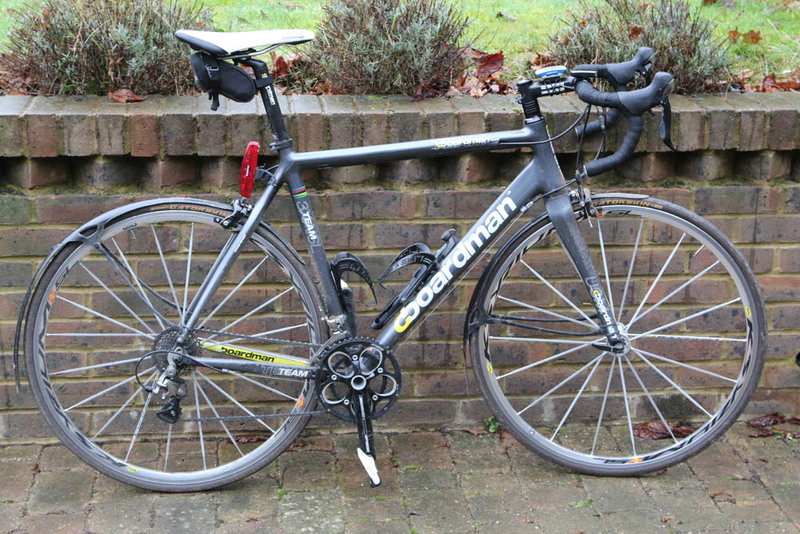 Winter is hard on bikes, and there’s nothing worse than watching your £3,000 pride and joy slowly dissolving. You don’t have to just use it in winter, though. A British summer can be just as wet and cold, so think of it more as a ‘bad conditions’ bike. Winter bikes can really be anything: your old road bike, a cyclocross bike, or even a mountain bike. Adventure and gravel bikes are becoming increasingly common, thanks to their wide tyres and disc brakes. Of course, you don’t need to make a new winter-ready purchase: many people hang on to their old bike when they get a new one and turn it into a winter bike. Winter bikes traditionally feature a metal, rather than carbon-fibre, frame with many people still swearing by steel. If you are buying from new, you’ll probably pick an aluminium bike. You can use a carbon-fibre bike, of course, but these tend to be more expensive and you may not want to get them all muddy and mucky. >>> Bike test: Aluminium, steel, carbon or titanium? It’s a choice that inevitably may come down to your budget, but you could put together a decent winter machine from new for £400-£500, much less if you go second hand. What should I look for in a winter bike? We’ve already mentioned that the fitting of mudguards is a must – they not only stop you getting wet, but they will also stop anyone riding with you suffering from your spray, and reduce dirt splashing all over the bike’s components. 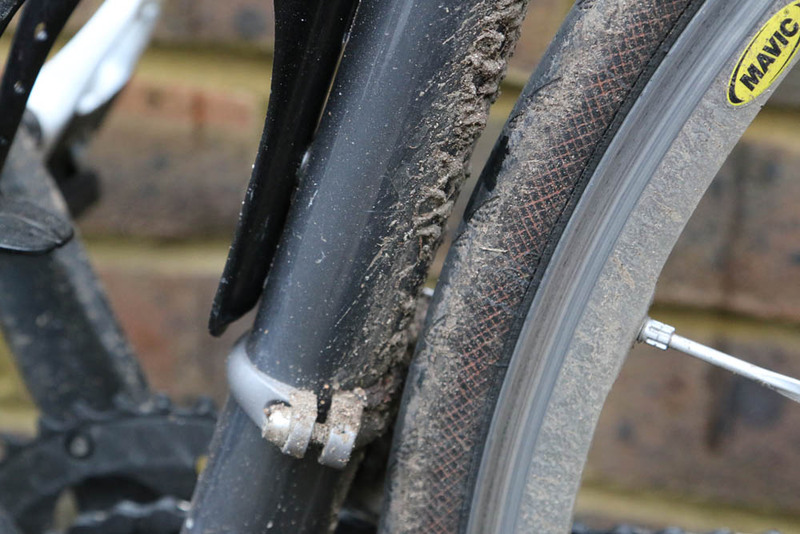 In order to fit mudguards, you’ll need a bike with clearance for them – so check that there’s enough space to fit them. If you are going for mudguards that require fixing to the frame with bolts, check that your frame actually has these bolt holes – most carbon-fibre frames do not. Equally, if you are going to fit 28mm (or more) tyres, ensure there is enough frame clearance to fit them. It’s a good idea to try and replicate the riding position across your road bikes, so compare how your bikes are set up or you may find it uncomfortable swapping between the two machines. More assured braking, especially in the wet, make disc brakes a solid choice on a winter bike. The removal of the standard rim caliper also means there is likely to be more clearance for those must-have mudguards. What sort of wheels should I use? While you may have the lightest, flashiest carbon-fibre rimmed wheels you can afford on your ‘main’ bike, you should really fit something intentionally robust on your winter bike. As the contact point with all that winter grime, you can expect your wheels to get a thorough coating of gunk. Many people keep a set of old alloy wheels just for the purpose – perhaps OEM ones that were upgraded from their main bike, or ones picked up cheaply in a bike shop sale. Fitting tyres with puncture resistance and wet-weather tread is also a good idea. Most tyre manufacturers offer at least one winter-specific model. With all that equipment on board a winter bike it is inevitably going to be heavier than your main machine. If it isn’t, then we’d suggest your best bike needs to go on a diet. A weighty winter bike is going to be slower going – factor in weather/road conditions, and you won’t be setting any land speed records on it. But wait until you get back on your best bike ion Spring and see how you fly up those familiar climbs. Some people fit lower gears to a winter bike so that they are more comfortable hauling its mass up hills. A compact chainset with 50/34-tooth rings coupled to a wide-range cassette with large 28 or 32-tooth low gear may be a good idea. Others prefer to exactly replicate the gears on their main bike. There’s not much point fitting Shimano Dura-Ace on a winter bike either, something from Shimano’s or Campagnolo’s lower or mid-range groupsets offer functionality and cost-effective replacement should parts start to wear out. Is it worth buying an off-the-peg winter bike? Several manufacturers offer ready-made winter bikes, complete with mudguards. If you have the money, these can be a good option. If you don’t have that sort of budget, then a second-hand bike can be a good starting point. How do you look after a winter bike? Look after your winter machine as you would your regular one – check over components regularly, and pay particular attention to rim wear, brake block wear, the condition of your tyres, bottom bracket, headset and hub bearings. The chain and transmission components will inevitably need to be kept well lubricated to deal with wet conditions. Spraying your chain with light lube, such as GT85, after a very wet ride or after you have washed it should prevent it from going rusty, particularly if you’ve ridden on gritted/salted roads. You can then wipe off the light lube later when the bike has dried out and replace it with a lube with higher viscosity, as this is less likely to wash off when riding. Be aware, though, that stickier lubes have the side effect of attracting dirt, forming a black paste that wears through components with frightening ease. You will have to degrease your chain if the build-up gets out of hand. So, can I do without a winter bike? Of course you can. You can carry on riding your regular bike all-year round, but just be wary that you will inevitably have to deal with component wear, and that may turn into an expensive business – possibly even false economy. There’s also an element of fun getting on a cheap and cheerful bike, a faithful companion in adverse conditions. If nothing else, it will make you appreciate your best bike even more, and you’ll feel like you’re flying.